Python molurus is a large nonvenomous python species found in open rocky habitats, deserts, cultivated lands, grasslands, marshes, scrub forests, mangrove forests, deciduous forests, and wet tropical forests known by the common names Indian python, black-tailed python and Indian rock python. The color pattern is whitish or yellowish with the blotched patterns varying from shades of tan to dark brown. This varies with terrain and habitat. The animals from the Sri Lankan locale, also known as Ceylonese or Pimbura, tend to be on the shorter end of that spectrum and larger bodied than the mainland form. Juveniles may be housed in appropriate sized tubs/racks and can live in a 41qt size up to about a year. At 1 year old they will more than likely need to be moved into an enclosure with the minimum dimensions of 1.2 X 0.6 x 0.4 meters (4 x 2 x 1.5 feet). Height is not very important as they are completely terrestrial, the only advantage to taller cages is easier access for cleaning. By the time they are 3 years old they will probably be ready for an enclosure that will suit them for their adult life. A good recommendation for adult Python molurus would be an enclosure that is 2.4 x 1.2 x 1.2 meters (8 x 4 x 4 feet). In this scenario I have found that if given a choice between additional length or width in caging it is always better to opt for more width as they spend much of their time coiled at the warm end of the cage. I have found that hide boxes can be useful for young Indian Pythons especially those that tend to be nervous or aggressive in nature. I put the appropriate sized plastic hide box at the warm end of the cage. 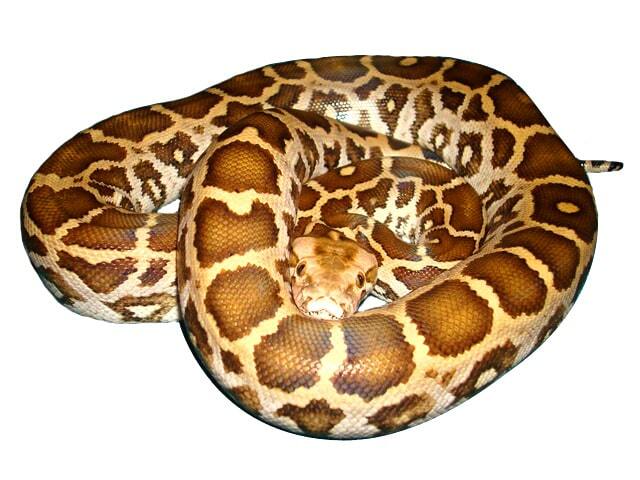 I have successfully used many different substrates when housing Indian Pythons. For many years I used shredded aspen bedding and it was very good for absorbing water but will mold quickly if not changed and also tends to keep the cage to dry causing problems with humidity. Currently I am using cypress mulch that is sold in the home improvement stores for landscaping use. It is a good idea to freeze this product or treat with a reptile safe mite preventative before use. This product has proven to work great for maintaining humidity and absorbing spills without molding quickly. There are other suitable reptile specific substrates on the market such as those with coconut husk in them that will give similar results but can be rather expensive when filling such a large floor space. Indian Pythons seem to thrive best when kept at an ambient cage temp of 26-28 ºC (80-82 ºF) and given a basking spot of 33ºC (92 ºF) all the time or at least during the daytime. Heating can be provided through different means depending on your particular set up. My cages are heated at one end with either heat cable or heat tape under the cage that is thermostatically controlled. Radiant heat panels are becoming very popular in the reptile hobby and are also a good option in conjunction with a quality thermostat. They are mounted to the top side of the cage at one end to achieve a basking spot. In some types of caging the use of a heat lamp can work. I recommend being very careful with this type of set up to ensure that the snake cannot get close enough to the bulb to burn itself and that it is installed in a way that does not become a fire hazard. With that said I do know some people have had success by keeping Indian Pythons in cages in rooms that are constantly heated to 26-28 ºC (80-82 ºF) and are never provided a basking spot. Lighting may be provided by fluorescents or LED mounted inside the cage or as simple as the light provided from an overhead lamp in the room itself. I recommend providing 12 hours on and 12 hours off year round unless breeding efforts are being attempted and you are “cycling them down”. This is a topic that is more in depth than can be discussed in this care sheet. Provide fresh water at all times. I use plastic tip proof dog bowls for the younger pythons and large cat litter pans for adults. Occasionally they will try to soak in their bowl. Indian Pythons do not seem to have as high of humidity requirement as most of the other large pythons. Burmese Pythons in particular seem to be very susceptible to repertory issues if not provided 60% or better relative humidity at all times. Indian Pythons however come from a more arid region and can thrive in 30-50% relative humidity. This is pretty easy to achieve based on the substrate used and the use of a room humidifier or occasional misting of the cage if needed. Indian Pythons should be offered at least one prey item of the proper size weekly at a minimum until they reach adult size and then feed accordingly to maintain healthy weight and body structure. I do not recommend “power feeding” any animal but a more rigorous feeding schedule will not be harmful to an Indian. However, Indian Pythons, in my experience don’t achieve the rapid growth rates seen in Burmese, Retics, and other Pythons. A freshly hatched baby may not eat its first meal till after it has its initial shed. At that time they can be offered either weanling mice or rat pinkies unless they happen to be a rather small hatchling and then start with mice pinkies. I prefer to start with rats so as not to have them develop a preference to mice which will quickly become too small of a meal. I have had Indian Pythons that have been very picky eaters and only willing to feed on chickens or other fowl. As soon as possible I begin to converting them to eating frozen thawed prey items only. If you are not familiar with the benefits of frozen thawed over live or how to go about getting an animal to switch I recommend you research the topic. I have also had Indian pythons that were picky when it came to frozen thawed and I have opted to feed live rather than struggle with them to get them to eat. Indian Pythons will grow through rat sizes until they are somewhere around the 2 meters (6-7 feet) mark, usually at about 3 years of age, and then they will do best to be switched to very large guinea pigs or appropriate size rabbits. In general, Indian Pythons from a mainland origin have a reputation as being a gentle species with the Sri Lankan locale being known as some of the most aggressive pythons in the hobby. I tend to disagree with this reputation and consider them to be very variable in personality based on the individual snake and the work the keeper is willing to put into handling from early on. I will say that Indians are in no way as docile and trustworthy as most captive Burmese Pythons. I have had both mainland and Sri Lankan animals that have ranged from very laid back, to nervous and flighty, or in some cases very aggressive. I recommend a good knowledge of handling large constrictors and/or starting with a baby and handling it often. As with any large snake, no matter how well you know and trust it, you should always have someone present as backup when handling or cleaning the cage. With those Indians/Sri Lankans that do have a nasty disposition two people is always a must when accessing the cage as well specialized tools such as hooks and shields. They are very powerful and can be explosive and fast for their size. All large reptiles command knowledge and respect. As with all reptiles, keeping their cage clean is very important to maintain healthy animals and prevent many ailments. With my snakes I spot clean on a weekly basis at a minimum or as soon as I notice a defecation. I replace the substrate as needed when spot cleaning. Every three months I completely remove all substrate and deep clean the cage using a mix of dawn dish soap and bleach and/or F10 a veterinary grade disinfectant. Indian Pythons shed like any other python based on their growth. So the more you feed them, the faster they grow, and the more they shed. It is always a good idea to ensure the humidity is on the high side with additional misting when they are going into a shed, especially if they have had trouble in the past with partial sheds. If the snake repeatedly has bad or partial sheds even when husbandry is good or seems to be shedding excessively consult a veterinarian. No specific potential health problems to mention for this species beyond those affecting reptiles and/or pythons in general. They seem to be a relatively hardy animal when kept properly.